IPL technology is a home-run advancement in rejuvenation that is safe, non-invasive and has no downtime Photo rejuvenation erases skin damage without disrupting the skin surface and simultaneously treats a wide range of facial problems to improve the texture, uneven coloration and complexion of your skin. This is a low risk, "no downtime" treatment - you can resume all activities immediately. Dr. Rhoda Narins treats patients in the New York City and Westchester County Areas. 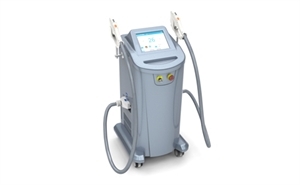 Dr. Narins now uses the newest FDA approved IPL system, the Preci Pulse IPL Therapy System. Preci Pulse uses multi-pulse technology to make the treatment more efficient, allowing Dr. Narins to select different pulse width and duration for different target tissues. The Preci Pulse combines the IPL option with a cooling system yielding a pain-free and comfortable treatment for patients. IPL minimizes red and brown spots while it evens out skin color and texture, and decreases that red flushed appearance from the skin. You can treat the entire face, neck, arms, hands, chest, back etc. This is a new breakthrough in anti-aging treatments. Typically, 4-6 treatments are done over a 2-4-month period depending on your schedule. Treatments are spaced approximately 2-3 weeks apart. How long will improvements last? Improvement lasts for several years. Maintenance treatments at 6-12 months are wonderful to maintain the clearer, less sun-damaged and smoother skin. How is the treatment preformed? A cold gel is applied to the area being treated and the smooth surface of the IPL hand piece is gently applied to your skin. The pulses of light produce a slight sting and the treatment takes 15-20 minutes. A topical anesthetic cream may be used. A series of 4-6 treatments provide excellent long-term results, minimal adverse effects and high patient satisfaction. You can immediately resume all regular activities. By dividing the treatment into several sessions, you get gradual improvements with low risk. This is a wonderful "no downtime" procedure. Can I combine this treatment with other "No Downtime" treatments for enhanced results? Women and men from Westchester County, Manhattan, and other parts of New York City visit dermatologic cosmetic surgeon Dr. Rhoda Narins for wrinkle treatments, liposuction, and laser skin treatments. Call (212) 288-9910 (Manhattan) or (914) 684-1000 (White Plains) to schedule an appointment and learn more.